A hockey fan wearing gear from the opposing team waits in line at the Golden Knights team store at T-Mobile Arena on the Strip. He is waiting to buy Vegas apparel — a scenario that played out repeatedly during the franchise’s maiden season. The team’s massive first-year success, everything from standing-room-only crowds for practice to finishing with the best record for an expansion team in any major sport, shows Las Vegas and professional sports are a good match. That was one of the messages Friday at Nevada State College in Henderson during a panel discussion of the area’s sports executives organized by the Latin Chamber of Commerce. In addition to Bubolz, the speakers included Marc Badain, president of the Oakland Raiders; Rushia Brown, player programs and franchise development manager for the WNBA’s Las Vegas Aces; Chuck Johnson, general manager and vice president of marketing for the Las Vegas 51s; Brett Lashbrook, owner of the Las Vegas Lights FC; and Jeff Motley, vice president of public relations for the Las Vegas Motor Speedway. Before major professional sports arrived with the Golden Knights, one concern was potential distractions for a team in a 24-hour town. 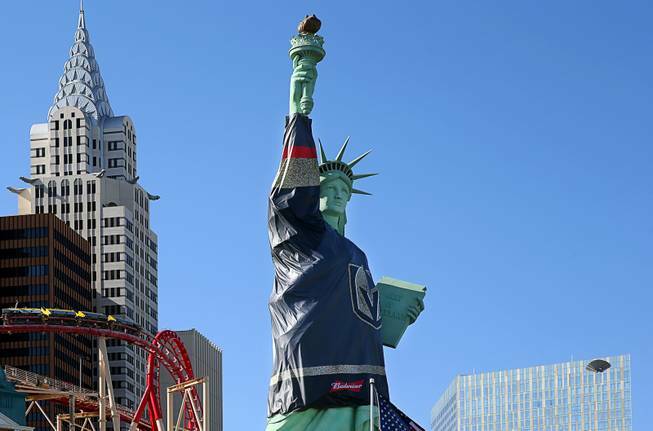 When Vegas started winning games early in the season, some credited it to the “Vegas flu,” or the visiting team getting caught up enjoying the Las Vegas nightlife. One of the reasons for the success is the massive home ice advantage, which many believe is the best in the NHL. Knights officials were determined when the franchise launched two years ago to be visible in the community because they realized that was crucial in growing a fan base. The town’s other teams have a similar strategy. When the WNBA Aces announced its relocation plans in November, the team wasted no time in trying to connect with its potential fan base. It hosted fan events at Mandalay Bay Events Center — its home arena — and has made numerous appearances around town. It’s also aggressive in working with the youth girls basketball community. Part of the marketing includes the local teams working together. For instance, the Lights’ Joel Huiqui wore a Vegas Golden Knights jersey when he was introduced in a game last month, and Aces players attended a Golden Knights playoff game last week. More important, fans at one game often have on gear from another of the city’s teams. It’s helped grow a passion for the city with residents. When the NFL arrives in town in 2020 with the Raiders, it will fit in with the city’s growing sports landscape, the group said. With the area continuing to expand with residents, sports executives aren’t worried about the valley being able to support each team. When you consider the area will soon have two new venues — the $1.8 billion stadium for the Raiders and UNLV football, and the 51s new stadium in downtown Summerlin — the general consensus with the group is the memorable nights in Las Vegas sports are just beginning.